My 8700SST is about 25 years old and gets daily use in the cardio mode. My problem is that the sampling rate is too slow, about every 15 seconds, so my heart rate is allowed to go higher than the range, then it overcorrects so the heart rate is below the zone, and it doesn't really stabilize in the 40 minutes in-range I use. The sampling rate needs to be every 5 seconds or so to prevent this problem. I am 74 years old, use 120 as my target heart rate, maximum 3.5 degrees incline and maximum 3.5 mph. Is there a software update that will fix this? Everything else is fine. Join in and write your own page! It's easy to do. How? Simply click here to return to Landice. We have a 1986 Landice thay my husband,and I use almost every day. It has run perfectly from the day we bought it and we would never sell it because we can't replace it for what the quality is worth to us. We need one with a longer belt, so I am looking for a used L8 right now for him. That way we can run together. We have never serviced our Landice since we bought it. It is the programable module with 4 user options. It has never rusted even though it was on a concrete basement floor for many years. We would never consider owning anything other than a Landice. This is the mother ship, you better live on the first floor and have some strong backs to move it. You can't use it and not love it. I am giving this review not to advocate for the specific model but to provide insight on the durability of the Landice products given I have had mine for 11 years. I bought the 8700 for $3,600 Sep 1997 and I am still running strong on it with over 6000 miles logged on the machine. My husband occasionally runs on it and has logged an additional 500 miles on it. I have been out of the country for three years so it did get a break. During the winter I use it almost exclusively and for many of my spring summer and fall miles on it. I love running but I am a fair weather runner who prefers certainty. Within 6 months after we bought it the rear feet gave out. Landice promptly replaced them with commercial grade feet and we have not had any other problems with the feet since then. Next to go, after about 6 years, was the heart rate monitor but since we used polar or Garmin products for biking and running this was a non issue although we could also contact Landice for a replacement part. In 2004 the incline and decline motor went and Landice also replaced it. We installed it with no further troubles. Lastly, about a month ago something went wrong on the computer chip as it has stopped tracking the statistics. Every individual run still works but the cumulative feature no longer works, may just need a reset and just sent the e-mail out to Landice to see what to do about it. Seems like a lot has gone wrong but considering the pounding it has taken I have been extremely pleased with it and the support from Landice. My model has aluminum arms that extended about half way along the bed that I find convenient yet non obtrusive. The incline and speed adjustment are not instantaneous but gradual so it is smooth and you do not have to hold on to the arms. I have the regular bed size and for my 5 ft 4in height and stride it is more than enough. My husband also runs on it with no problems at 5ft 10in and anywhere from 160-220 pounds (over 11 years you gain some you lose some). The bed is very firm and there is no excess slack in the belt, even after all these years. The motor case extends forward a bit too much and I end up kicking it a couple of times each run, although I do this on lots of models, I probably run to close up on the machines. We also need to correct the belt alignment at least monthly but that may just be the difference in my husband's and my running styles. I do run a bit more outside during the spring and summer and the transitions back and forth are easy with the Landice bed. I have read that Landice are pricey but if you are runner and do not use it as a clothes hanger or decoration it really is worth the price, I have run on some more economical models in smaller hotels and they are awful for even one run much less to own! I would like a new model but unfortunately this one keeps plugging along, I may break down and go for it if the computer chip cannot be corrected. I have tried the Life Fitness (while on travel) and while it has really kept pace with technology with some very cool features to include IPOD interfaces I cannot justify the cost ($7,000) since my home gym has a TV, speaker, DVD player and cable. Moreover, when I run outside I carry my IPod with me so running on the treadmill with it is no big deal. In addition, while the nice cushioned Life fitness bed is great it is very hard to transition to outdoors running while the rock hard Landice bed makes transition to the outside surfaces transparent. Both are good machines; just wish the Landice had a more creative interface. Somebody thinks you are an easy mark. Motors can be had from 265 to 350 and take about 15 minutes to install, if you are all thumbs. I've had my Landice 8700 Programmable for over 17 years and it still runs like a top and everything works on it. It's made three moves with me from the east coast to the midwest and gets a pretty good workout in the winter but stays pretty dormant in the summer as i do most of my workouts outside. I can't say enough good things about it. I can't thank my previous Father-in-Law for the gift/recommendation. He was a real workout buff and fitness guy who knew his stuff! Thanks Bob Frey! Thanks for your indepth personal information and recommendation for the Landice 8700. I am glad you found a treadmill that works for you. Thanks again for your contribution to our site. I've got an 8700P with about 3100 miles on it. The board went out 2 years after we bought it and Landice replaced it although i had to pay for labor and trip charge. For the past number of months the motor has gotten loud and now I'm getting a very loud bearing type metallic noise. A new motor and bracket run over $700. We've been happy with our Landice product, but am surprised that I've got significant motor problems at 3000 miles. The motor is a 3hp motor so it's not a lightweight and we don't get on the treadmill until the motor is up to a decent speed so that we don't stress the motor. 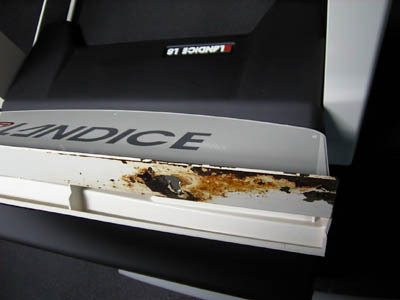 We bought a Landice L8 and within months, this super treadmill with a lifetime warranty, rusted! Landice said it couldn't possibly rust, but it did! I had to send them pictures to prove it and they wouldn't warranty it. They said they must have used steel on our model, instead of aluminum. They wanted us to pay to replace the parts! I found the deck to be pretty hard to run on. It's not as soft or cushy as I would like, either. The issue the guy is talking about is true I have seen it in person. 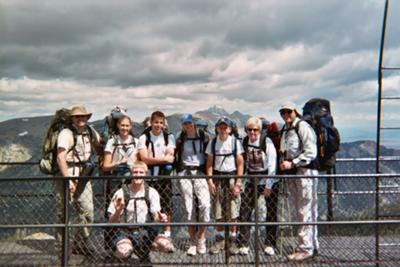 In that year they Landice had issue with that treadmill I am a tech seen it a lot. That looks like the Landice x50 model, which is pre-2004, and the rusted part you've photographed appears to be the book holder held against the motor cover (notice the writing is right way up, despite the cover writing being upside down), so I think you're being somewhat disingenuous here. I've a 2001 Landice 7 (750 series) and it seems these weren't made entirely of aluminium, but steel components. It's the x60 and x70 series that followed which are aluminium. Having said that - the body of my L 7, despite having been in the tropics for nearly 10 years, is still solid with only surface rust on the VFX deck slats underneath the running belt and between the side frames -- easy enough to fix with some KillRust. Just bought an L-8 Pro-Sports Trainer (this is the same as an L-7, only a little longer). I weigh about 235 lbs. The treadmill wont/cant maintain speed at anything over a 10% grade. If it is set at 3 mph, the actual speed will vary between 2 and 6 mph. It is horrible. The factory says "Thats just the way it is". The store I bought it from is now telling me I should trade in my 3 week old treadmill and buy a different brand. This machine is the biggest piece if junk I have ever used. Just wanted to add a review from for Fitness Source regarding my Landice L8 treadmill. I loved this treadmill till it broke down. fitness source has the worst customer service for repairing treadmills, their technicans set up appointments to see a treadmill but never actually see the treadmill. Then when you try to track them down, they are not availabe and neither is their manager!!! do not buy from this company!